Guide4WDW.com: How to Secure Last Minute Fastpass+ Selections - Even For Toy Story Land! How to Secure Last Minute Fastpass+ Selections - Even For Toy Story Land! How to Secure Last Minute Fastpasses - Even For Toy Story Land! Recently, we decided to take a last minute trip to go see Toy Story Land before the summer ends. Believe it or not, we booked our trip 3 weeks ago and will be flying out in one day. It's the shortest booking window we've ever dealt with and obviously that brings about a few challenges. Perhaps the greatest difficulty is that this late in the game, you've missed the 30 day and 60 day fastpass+ booking window. 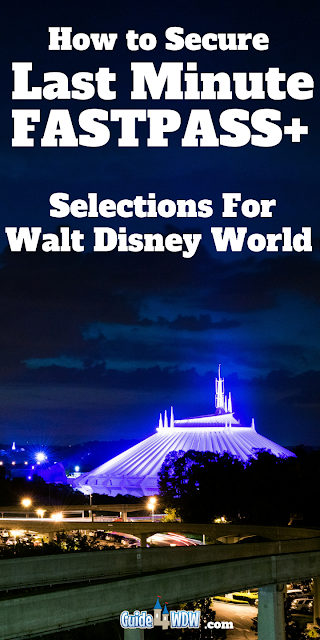 As always, it's incredibly difficult to secure the top tier and favorite attractions, but it's far more difficult when new attractions have just opened like Alien Swirling Saucers and Slinky Dog Dash. Believe it or not, we were able to secure a Slinky Dog Dash fastpass only days before our trip to the park. UPDATE: April 2019 - As you may have noticed, Toy Story Land has been open for nearly a year at this point. However, it is worth noting that all of these tactics still apply and the story is perhaps the best example I can share of the last minute fastpass+ booking scenario. Obviously, as with any booking system there are a few ways to work with the system and give yourself the very best shot at securing those hard to get fastpasses and at times it may be easier than you'd think to do so. Rather than just telling you to keep looking, today we're sharing some of the tips that have worked for us in securing Seven Dwarfs Mine Train, Slinky Dog Dash, Flight of Passage, and many others over the past year without spending hours on end searching the website. None of these are fool proof solutions and "your results may vary" but this is what has worked for us time and time again. This is one of those tips that sounds obvious but in practice is a bit less obvious than you may think. The tip in and of itself is to look when nobody else is looking. There's always going to be others looking on Disney's site with guests coming from all over the world, but the more random the time you check the better off you tend to be. When we were planning our last minute trip for this week, we found Alien Swirling Saucers at three different times by checking at 1:30 or so in the afternoon on week days. However, and likely the one more of you are here to find out about was our Slinky Dog Dash fastpass pick up. I'll be honest with you, this one took some time to get. We checked the app once or twice a day for around 3 days (far fewer attempts than some) but the passes popped up at 12:40 in the morning (yep... the middle of the night on the East Coast). Sure, it's not ideal but if you can check for passes at these strange times, you may be surprised at what fastpass selection you can get! The old adage of "if at first you don't succeed, try try again" is more true than ever in this case. If you're getting close to your travel dates, pick a night when you're doing nothing else, grab a seat on the coach and turn on some TV. Pull up your current fastpass+ selections and choose the one you like the least and select the option to "modify" your fastpass selection. If you get lucky your favorite attraction or the one you're looking for will pop right up... but I wouldn't count on. At this point, here's what I recommend. Take the next 15-30 minutes and continuously back out of the "modify" your selection menu and go back into it. As you search time and time again, you'll be surprised at how fast offerings change. I saw passes for Alien Swirling Saucers pop up on two separate occasions and two different times within the first 15 minute when we tried this a few days ago. That 15-30 minutes may be boring but if you're set on riding the attraction it may pale in comparison to how long you could have waited in the heat of the park! If you're late to the booking game like we were in this instance, you can't be overly picky about times. Take what you can get and modify it as more offerings become available using the tips mentioned above. With the exception of dining reservations, very little has to be done at specific times in the parks, and remaining flexible or being willing to stay late or head to the parks early can make a huge difference. Also, and perhaps more importantly, if you cant get the attraction you want at first book something else anyway! You can always modify your selections but if you don't have a fastpass+ selection to begin with, it makes the process that much more difficult. At the very least, you'll have a second favorite attraction to fall back on and one that may save you a few extra minutes waiting in line which you can spend in the standby queue of the attraction you couldn't get. Do not give up hope if your stay begins tomorrow or if your park day is the very next day. The greatest foray of fastpass changes and modifications will likely happen within the last two days for most guests or even the day of their trip to the park. Check the app religiously the day before your trip and you may be shocked at what pops up. Other guests flights get canceled or they may have to cancel their trip and if that happens you'll be there waiting for the fastpasses to get dropped! If you're in the parks, check early in the morning when you're in that particular park. Inevitably someone's plans will change or they'll realize their child isn't tall enough to ride an attraction they've booked or any other array of weird situations could unfold. On recent trips I have been utterly shocked at how many last minute great fastpass+ selections have been available while we were in the parks. At one point I was so surprised in fact that I almost modified a few of our plans just to grab a second ride on a few of our favorite attractions late at night. 6. Have Someone Look For You! 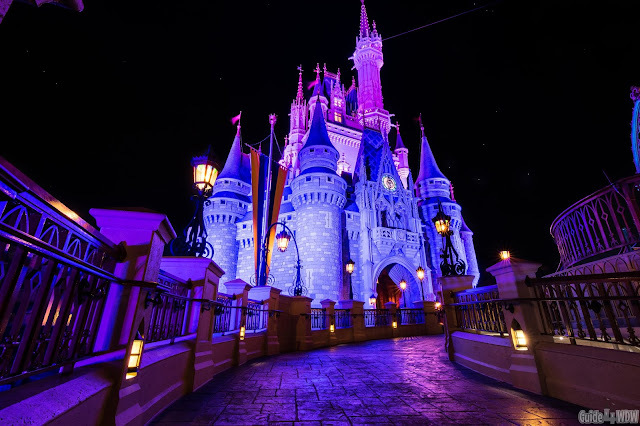 This may sound like a shameless plug but if you do have an interest in using a travel agency or already use a travel agency that really knows their stuff in the Disney realm, they may just look day after day for you. Many of the more experienced travel agencies will offer this service for you and I know for a fact that our recommended travel planner offers it completely free of charge. It may not be the ideal solution for everyone, but if you really want to sit back and let someone else try to secure those tough to secure passes for you, it's always an option. Personally, I do opt to book them myself simply because I like to do all of these things listed above, but Travel Agents can be really helpful thanks to their knowledge of the Disney systems and when it is best (and worst) to look. You never really know when something will pop up when another guest has to cancel their trip last minute or decides to trade that pass for something else. They may even decide to go to a different park altogether. When that happens it occasionally frees up a tough to get pass for you and your family. Lastly and perhaps most importantly, if all of these strategies fail, don't worry about it! Standby isn't the end of the world and you'll get to experience the queue of the attraction and the queues are becoming more and more interactive as the parks continue to grow and change.